Is the title of a new exhibition at the National Maritime Museum, Greenwich ( Greenwich Maritime on the DLR ) which runs until 28th March and is worth a visit. The famous diarist lived through one of the most turbulent and dramatic times in British history and, fortunately for posterity, he wrote about it all in his diary. He was, as a civil servant and a senior administrator of the Navy, very much at the centre of political life. Co-incidentally, I have just finished re-reading Neal Stephenson’s excellent Baroque Trilogy ( ‘Quicksilver‘, ‘The Confusion‘ and ‘The System of the World‘ ) in which Pepys is a character. Stephenson’s hero is the fictional Daniel Waterhouse, who watches Charles 1’s head fall while sitting atop his father’s shoulders, sees the Restoration, the plague, the Great Fire, the formation of the Royal Society, the Glorious Revolution and the eventual accession of George of Hanover. In fact, Pepys actually saw most of this in real life. London born and bred, he was fifteen when Charles was beheaded in Whitehall. He spent much of the Protectorate at Cambridge, then returned to London just in time for the Restoration. He found a post as a navy clerk, married his wife Elizabeth and wholeheartedly partook of the pleasures which Restoration London had to offer. From him we have descriptions of the London stage, newly re-opened, and of various haunts for eating, drinking and other pleasures. The exhibition illustrates all of this with artefacts and paintings as well as a clever moving silhouette of a theatre stage ( ‘Better than telly’, I heard someone say ). There is information on the plague – one fifth of all Londoners were killed by it – and a room showing the fire, spreading across the map of London, as excerpts from Pepys diary are played, read by an actor. He and his family were forced to flee their house, taking what they could of his family’s possessions. There is also a good section on the formation of the Royal Society and how Pepys became a member of that august body. 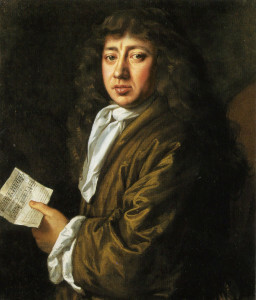 Pepys moves further up in the world with the coronation of James II, becoming the most senior civil servant in the Navy. 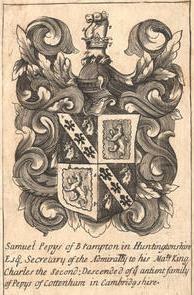 But his star falls with the accession of William and Mary. So, did this exhibition tell me things I didn’t already know? Yes. I was entirely ignorant of Pepys’ foreign travel and the journals he kept while in Tangier and Morocco. I have always thought of him as someone whose life was entirely centred on London. There are rooms on war with the Dutch and his various naval projects. He seems to have been a committed, hard-working and highly efficient bureaucrat, not just the pleasure-loving young man his diaries show. Eventually, he retired to Clapham, which was then a village just outside London. In ‘Capital‘ John Lanchester’s recently televised novel, which is set in Clapham, the story unfolds on the fictional Pepys Road, just north of the Common, which was where Pepys lived and died. If you visit, I suggest that you consult the small guide with which you are presented when you buy your ticket before you enter the exhibition. Once inside, the labellings of the various sections are not always clear and I found myself in Restoration England before I’d seen the section on the Protectorate. It was very crowded when I attended, perhaps it will be easier to navigate without the crowds. Tickets cost £12 for adults, with concessions. You might also like to take a look at Phil Gyford’s website Pepys Diary, a Guardian Best British Blog prize winner in 2003. It also supports the Twitter feed. @samuelpepys so, in one form at least, Pepys, and his diary, are still going strong. 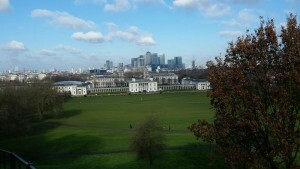 This entry was posted in Culture Vulture, History, London and tagged History, London, Worth a visit by juliej. Bookmark the permalink.